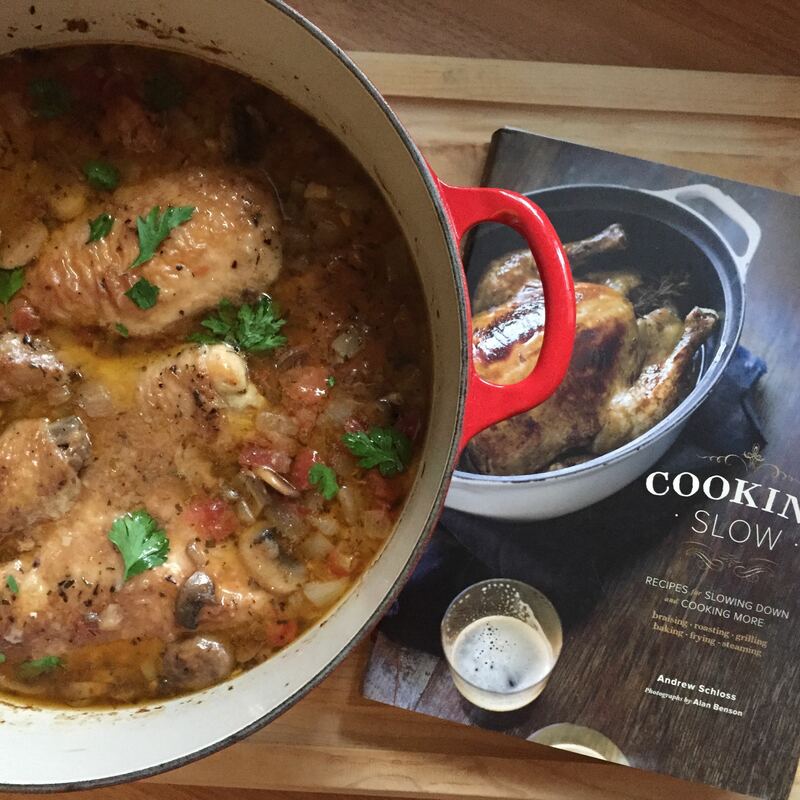 Even though it’s hot as hades outside, this slow cooked, one pot, perfect for a cold winter night meal, hit the spot. Sometimes a meal is perfect for a certain season, and sometimes a meal is perfect for a certain time your life. James and I recently made a couple big life decisions and I was craving a Shabbat meal of comfort food. I put this in the oven at 1pm on a Friday and it cooked for six glorious hours in the oven on a low temperature setting. I served it over Israeli cous cous, along with challah, salted butter and wine. We shared the meal with good friends and it easily fulfilled my craving. The chicken was falling-off-the-bone tender and so savory. After we finished the left over chicken the next night, I saved the remaining sauce and served it over cavatelli for a simple pasta dish. Mix together flour, 1 tsp. salt, 1/2 tsp. pepper, and Italian seasoning on a big sheet of aluminum foil. Toss chicken pieces in flour to cover completely. In large Dutch oven, pour olive oil to coat the bottom and place over medium-high heat. Heat until oil is shimmering hot. Working in batches as needed to avoid crowding the pot, add chicken pieces to hot oil and cook until nicely browned on all sides, about 10 minutes per batch. Transfer chicken pieces to plate as they are finished. When all the chicken is browned, set aside. Do not discard remaining flour mixture. If the pot seems dry, add more oil. Then, add onion and mushrooms and saute until veggies are soft. Add garlic and saute. Add reserved flour mixture and stir until dissolved. Add wine and bring to a boil. Add broth, tomatoes plus their juices, anchovy paste and parsley, and stir to mix well. Return to simmer. Add salt and pepper to taste. Return chicken to pot along with any juices accumulated on the plate. Cover the pot, transfer to preheated oven and cook for 6-7 hours. Serve over Israeli Cous Cous or another small pasta, garnish with parsley and serve! You are so creative, Emily! Love to read your comments & of course the recipes too! I’m a reformed vegetarian – started eating chicken a year ago after being raised a veggie. I told my boyfriend I was going to make him chicken from start to finish this weekend. I saw this and had to try it – AMAZING. Thank you for sharing!